May 1, 2018 - Pleasantville, New York – The Gordon Parks Foundation today announced exhibition dates for I AM YOU, a new exhibition of photographs by Gordon Parks. 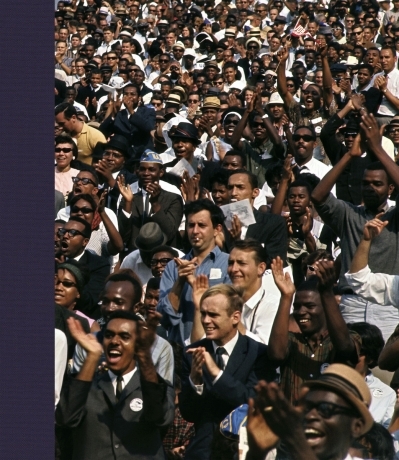 The exhibition, which explores Parks’ civil rights and social justice photographs, will be on view at the Foundation’s exhibition space from May 11 through July 13. The exhibition is free and open to the public. I AM YOU offers both Parks’ iconic photographs and his lesser-known pictures side by side in an exhibition that investigates themes of racism, poverty, and bigotry that the artist explored throughout his seventy year career. The earliest picture on display—American Gothic, Washington, D.C., 1942—is not only Parks’ most recognizable, but also one of the most important photographs of the twentieth century. Little seen early color images of segregated Alabama are shown alongside leaders of the Civil Rights Movement, like Malcolm X and Dr. Martin Luther King, Jr. Images of boisterous demonstrations are shown alongside moments of quiet protest. Gordon Parks was born into poverty and segregation in Fort Scott, Kansas, in 1912. An itinerant laborer, he worked as a brothel pianist and railcar porter, among other jobs, before buying a camera at a pawnshop, training himself, and becoming a photographer. During his storied tenures photographing for the Farm Security Administration (1941–1945) and Life magazine (1948–c. 1971), Parks evolved into a modern-day Renaissance man; he found success as a film director, writer, and composer. The first African American director to helm a major motion picture, he helped launch the blaxploitation genre with his film Shaft (1971). He wrote numerous memoirs, novels, and books of poetry, and received countless awards, including the National Medal of Arts, and more than fifty honorary degrees. Parks died in 2006.